The construction of divine images and their subsequent meditation and worship brought pureness in thinking and gave mental peace to the human being. Iconography means depiction of images through different artistic style. In Indian sculptural art, images are the symbolic representations of divinity whose origin and end is expressed through the religious and spiritual beliefs. Iconography is concerned with historical art form that deals with the representation, identification, description and interpretation of the content or subject of images. Indian iconography inherits various attributes and variety which requires a careful and systematic study. The simple and rudimentary type of figures developed into complex forms in the later period. Additional attributes were developed and the earlier ones frequently discarded or modified. Sometimes earlier iconographic concepts change so frequently that the original was difficult to recognize. They represent an elementary iconography which grew into a complex one during the succeeding centuries. The few existing images of the first two centuries and after the Christian era are simple and are based on the popular “Yaksha” type. The cult of Kubera, Vasudeva and Siva are the most important in the two centuries B.C. The crown of Visnu and other deities is absent in earlier form, which were very popular in sculptures of later period. Rudra (Described as ‘ Usnisin’ or one wearing a turban in Yajurveda) ,the representation of Siva at Gudimallam belonging to 2nd century B.C.E also show him wearing a turban. The turban was the only head gear known and the mukutmani or head gem was wrapped in the turban centrally or towards one side. In earlier age, sculptures were without “Yajnopavita” but it became an invariable feature in all later representations. The regular “Yajnopavita” appear for the first time in the Ikshavaku sculptures. The development of ornamental motifs is clearly visible by the changes in Pallava,Chola and other periods in South India. The changes were not only limited to Yajnopavita alone but also observable in Swarn Vaikaksha, Udarbandh, Katisutra, and in the arrangement of drapery also. Buddha was a popular person during his life. His followers were worshipping him as a medium of life for this world as that of the heaven. After the Parinirvana of Buddha, his followers tried to highlight the important events of life of Buddha. Gradually the devotion for the worship of Buddha, simultaneously with the prevailing Bhakti movement converted the mahapurusha. Buddha into divine form of Buddha. The early figures of Buddha were different and distinctive from those of human because of their distinct lakshans. The second phase of development of Buddhist art is associated with Kushana Period. Buddhist texts like Divyavadana, Deeghanikaya, Lalitvistara and etc, mention commonly the iconic form of Buddha indicating 32 mahapurusha lakshnas. The important Lakshans of Buddha include Usnisa, Nasagradrishti, elongated ear, webbed limbs (Jalanguleeya hastapada), chakra on palm and etc. while different hasta mudra and drapery are not concluded in Lakshans. 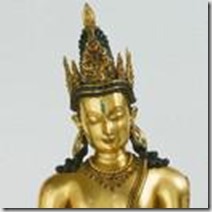 Before the emergence of Buddha in human form he was represented by certain symbols. These symbols were transformed into the anthromorphic representation before the accession of kanishka.This was the phase when the symbols and images both were reluctantly shown. In Hinyana Buddhism there was no pantheon to which worship was offered. But In Mahayana phase a large number of deities were included and later in the more advanced form of Vajrayana the pantheon became surprisingly large with the deities of every description.Once the concept of pantheon was established the depiction and description of of five Dhyani Buddhas with their mantras, Mandalas, sakties or female counterparts started appearing. These Dhyani Buddhas represent the five Skandhas or the five cosmic elements of which the world is composed. The off-springs of these Dhayni Buddhas constitute their family.In this way, the Buddhists built a well-classified pantheon with its multiplicity of gods and goddessed and when they were represented in art, these were depicted with holding on their heads and miniature figure of their parental Dhayni Buddha. They were given different colours, different expressions and different companions as per their tantaric rites as they were required to discharge functions, eg. from curing a disease to the killing of an enemy. The artists as per the recommendation of texts, added extra hands and feet to suit their own ideas to have their goods in a powerful form.